Traces of a Stream: And The Winner Is!!! 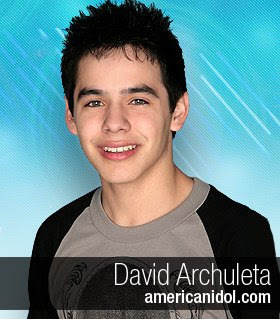 After Watching American Idol last night I am going to call a winner...DAVID ARCHULETA! I have to be honest, I always thought that David Cook would be the victor. He had the whole package, great voice and very good guitar playing. Something happened last night because Cook seemed to lose steam as the show progress as Archuleta picked up more momentum with each song. I am sure it didn't help that after every round Simon declared David Archuleta the winner. Don't get me wrong David Cook sounded good, it was just that David Archuleta sounded better. His song choices were definitely better. Cook missed his opportunity on his last song by not choosing to revisit songs he had performed well in prior weeks. Archuleta chose to perform "Imagine" and Cook should have countered with "Billie Jean". He is going to look back on this night and realize that he blew it. I would be interested to know if others watching the show saw the same thing that I saw. It sort of seemed like Cook choked at the end and I was actually rooting for him. Although I am not a rocker per se, the guy is mad talented. I concede, congratulation Archuleta. I agree 100%. I said before I thought David Cook was going to take this thing, but Archuletta, as far as performances go, blew him away. Which kind of makes me wonder if Cook didn't want to win and be bound to the Idol contract or something. He certainly didn't bring it and that's the first time I haven't seen him bring it. This is the first year on American Idol where I have liked both final contestants equally. I think both of them will go places. RC, I think you are right about the contract; however he still has to do that cheesy Idol traveling show with the rest of the top ten. I was upset that he didn't redo "Billie Jean". I don't think he wanted to win, I think he wanted the recognition that Idol brings. For instance Chris Daugherty didn't even make the top three, but he has a very lucrative career, as does Jennifer Hudson. On the other hand you have Taylor Hicks who did win Idol, but was unceremoniously released from his record contract. Cook and Archuleta will do just fine. Although I haven't watched AI much this season, the recent news stories I read all predicted that Archuletta would be the victor. I was shocked to read tonight that David Cook was crowned the winner. According to Ryan, it wasn't even close... about 12 million votes separated the two Davids. It sounds as if David Cook would have been fine whether he won or not. As did you, one writer cited the post-AI success of rocker and non-winner Chris Daughtry as an example. Yeah Malcolm, I got egg on my face. I was just so sure. Archuleta did an amazing rendition of Elton Johns "Don't Let The Sun Go Down On Me". Although I felt Cook could have performed better, he still wasn't a slouch. I thought the teenage girls would have swung the vote Archuleta's way.